Suitable for 2 adults & 2 children. Swanage beach is a 10 minute drive. Turn right on to the main road and follow until you see the beach! 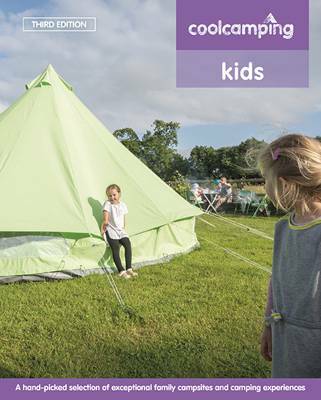 Suitable for tents of all sizes. Swanage beach is a 10 minute drive. Turn right on to the main road and follow until you see the beach! Woodyhyde's latest addition for a relaxing holiday. 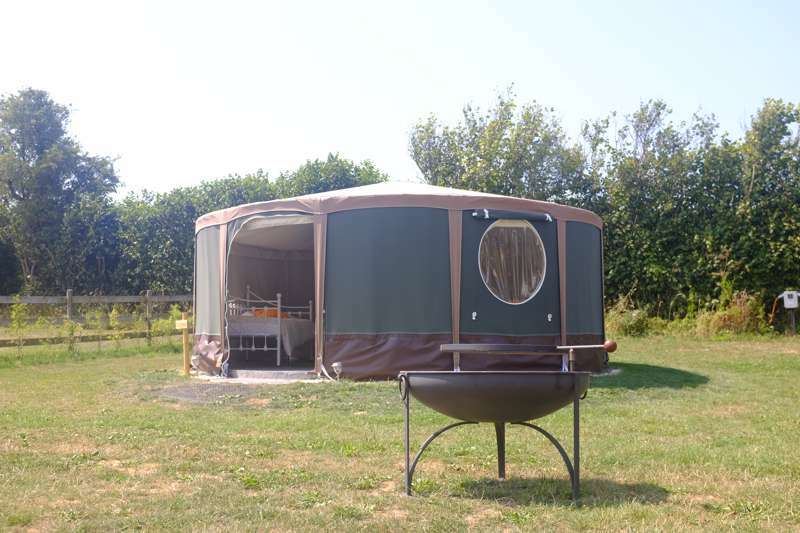 A classic Yurt providing a real bed, lights and electric. This is situated in a private paddock area and comfortably sleeps 2 but additional airbeds are also provided for families. In a region fit to bursting with wonderful campsites, we've come across a real gem in Woodyhyde. Set amongst the iconic chalky downs of the Purbeck Hills, this traditional family-friendly site lies in Dorset's spiritual heart. 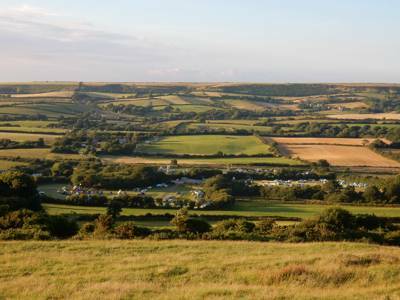 The campsite itself lies across three fields – a small field adjacent to the Swanage Steam Railway line, a spacious medium field, where you’ll also find the main facilities block, and a large field with acres of room and broad, countryside views. Wide-open spaces here are just crying out for rowdy ball games or a few flicks of a frisbee. Unmissable kiddy bliss. The leafy countryside vista is the perfect backdrop for some early morning yoga, but don’t be alarmed if your meditation is interrupted with a sudden woosh and parp – that’ll be the Swanage Steam Railway. The old engines whistle and wheeze past the site between Swanage and Corfe Castle. It’s just a pity it doesn’t stop right here – the nearest station is at Harman’s Cross, 10 minutes’ walk away. Being based on the Isle of Purbeck (in actual fact a peninsula, but we're not ones to quibble), you're just a stone's throw from some of the great beaches and coastal views that align Dorset's famed Jurassic Coast. Be sure to take time to visit the iconic Durdle Door – a huge natural limestone sea arch and, more importantly, unmissable photo opportunity. 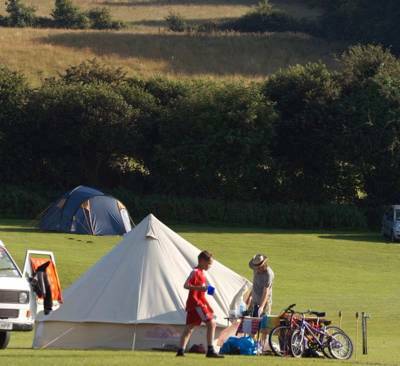 With refreshingly understated facilities, acres of space to explore, easy access to some of the region's hidden coves, and the obligatory steam train chugging gently past your tent, Woodyhyde is an utterly charming throwback to the camping of yesteryear. 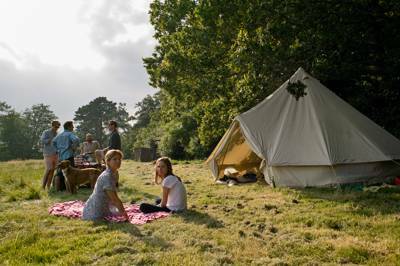 Sit back and relax as younger campers live out their own Blytonesque adventures. Location has to be the main draw for the site. On site shop has good selection of stuff. Found out when there you can have campfires (great) provided they are off the ground but the rules appear to state they are not allowed (maybe my understanding?). Toilet/shower blocks OK. Could be cleaned more regularly, water pressure disappeared when someone flushed the loo, and have better lighting. No Washing up areas under cover for when the British weather hits. Enjoyed the stay (4 nights Aug) but wouldn't be a must return to site. Ok, so I have 2 boys (3&5) and this was our very first family Camping holiday. 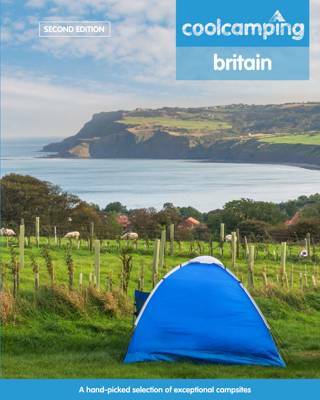 I had no great expectations and no previous UK Camping experience to base anything on. 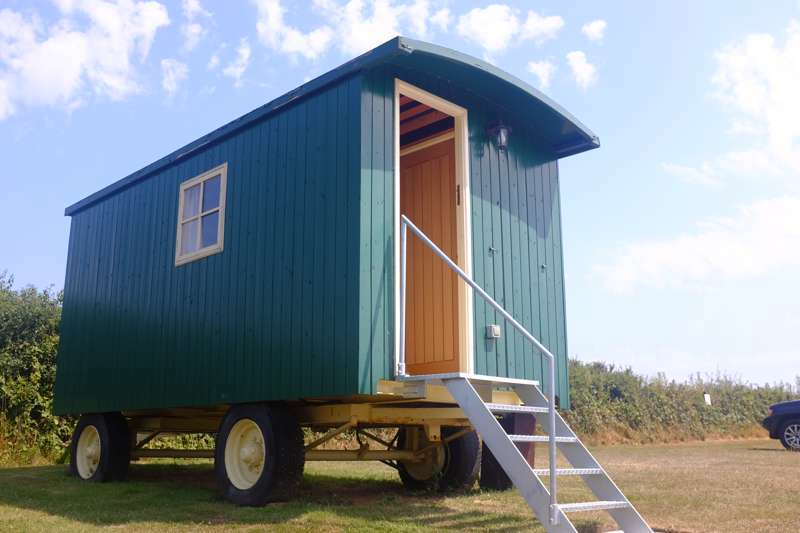 I have read previous review regarding the loo's and whilst they are a tad old, showers need tokens and have no real "dry space", I am used to long drops and limited shower space with cold water (S.A. Festival camping! haha) so this was a treat! The water was hot and the loo's had plenty of paper and toilet seats! 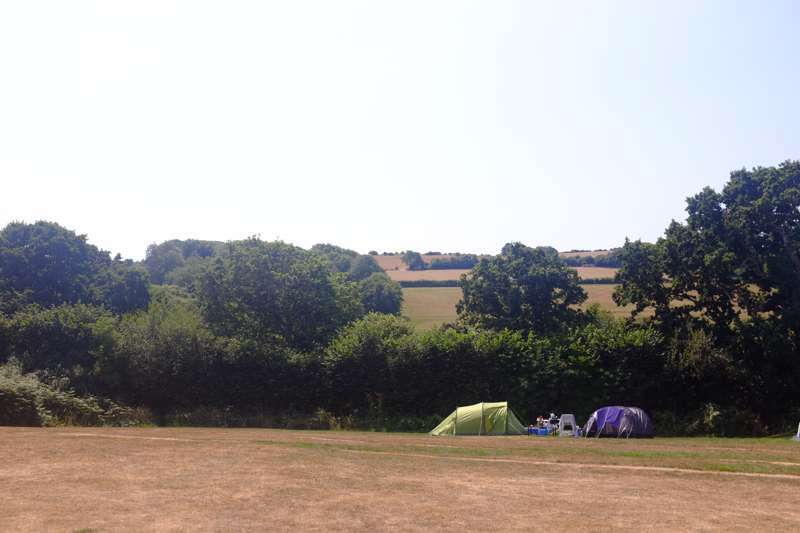 The Camp site is HUGE with 3 camping fields (2 dog friendly) and the pitch sites are non restrictive, so its literally find a spot and pitch - LOVED it! My boys were able to explore safely and make a bunch of new friends, neighbouring tent owners were all there for the same reason, kick back, relax and have a good time - we all seemed to achieve that :) The steam train runs along side the campsite (don't worry it doesn't run at night), but a great source of entertainment at each pass (if you like waving that is.) The shop was a god-send, with literally EVERYTHING you could possibly need if something had been forgotten, great beers and wine and the grocery essentials too... It is perfectly positioned for day trips to the local sights (catch the steam train - an added bonus!)... Durdle Door, Corfe Castle, Bovington Tank museum, Swanage sandy beach! (to name but a few). Loved the place, enjoyed our stay and will be back. Great location in beautiul countryside. Family of four with dog. The location is excellent with plenty of outdoor activities and some rainy day attractions nearby. Swanage is a quick drive or Steam Train ride away.The shop has gas and essentials including some decent local products and beer. The showers and toilet blocks are big enough for the size of the site and kept relatively clean and tidy. Electric hook-ups are available for tents. This was my first time visiting Dorset, and very much first time staying with woodyhye. First impression was amazing, very welcoming and well thoughtful shop which provide everything and anything you need and more to ensure your stay, even if you forget to pack or purchase anything the shop would have it, prices wise are very cheap and very good items and well stocks, pitches are very good size and well signs and kept well. The toilets and showers facilities are the one I can not get on, it was very dirty, toilets tissues were everywhere on the floors,showers are not something I like to visit a lot while I was there as I couldn't bring myself to enjoy it. 50p per shower which will lasted 4mins this would normally be enough time but because the way shower head been set to fan out water as wide, you don't know where you should stand to get the full effect of the water which you end up putting more coins in to wash yourself properly. The campsite had no playground so children/parents were allowed to pitch tennis/badminton and cricket and hit the balls to others people tents and cars, while we were there we witnessed a lot of misbehaving children that going round disturbing others in showers cubicles which have been reported as we waited outside for 10mins in the rain nobody came down to see or solve the issues, and another occasions police were called to take statements and taken up the issues with some children abusive behaviour, overall experience I feel that's fair to say I won't be hurry to return here as toilets/showers facilities which is a shame as the location itself was magnificent, short distance to many wonderful sights. We had a lovely week at Woodyhyde campsite. My children made lots of new friends and other families were really friendly and welcoming. Due to the rain during our stay it would be a real improvement if some of the washing up areas were under cover. This is a massive campsite, but never felt really crowded (considering we went middle of heat wave August). It reminded me of a laid back fesitival site (without the music). Popular with family groups, I love the ways the kids all mix together for a kickabout in the field. This is a fairly basic site - it's a big field, so you make your own entertainment. The views are nice with the local steam train that cuts across the fine views adding a sense of nostalgia to a bygone age. There is a shop (with odd opening hours - so make sure you make a note of those). There are 3 mean sections, 2 for groups with dogs, and a dog-free field. The shower block is reasonably new - but you require a token (50p). My daughter hated the showers, as there were no benches in there, and the shower was non-directional and token only bought a limited time (I found duration fine, but then I have a shaved head!). The toilets ... oh, dear. The toilet block could do with being knocked down. It is like a 70s public toilet block, and the odd lick of paint ain't gonna hide the fact that they could do with more than a refurb. Invest money from the shower block tokens!. Being of some age, the block can't handle it when the site is super busy. Toilets are broken, or needed repair on regular basis, exacerbating the issue of the awfulness of the bogs! Look there are better sites, but it was cheap (shower tokens aside) and a great base to explore the surrounds. Just be warned about the toilets. Great site, beautiful views and brilliant location. Everything was clean and well maintained. We had a really good time, nice families too. Will return for sure! Drainage and maintenance of shower block needs attention. Toilet paper all over the floor, water flowing outside the door of the disabled shower/toilet past the next toilet and into the following shower; a flowing river, making the toilets wet and horrid. We were two mums with four children, our tent got caught by wind and we struggled to hold onto it. A man who was driving a tractor to cut the grass past us several times and not once asked if we needed help. The washing up sinks do not have shelter, so you are open to the elements when it rains. There is no bin for the washing up area, rendering the area filthy with fish skins, bones and anything else which gets left around a sink. Yuck! The location of the campsite was fab, as was the cadre. it was really easy to find and the steam trains going through were great. Overall the site was well equipped however the toilet and shower block could have done with more frequent cleaning. We were disappointed that we could not get tokens for the showers until after 9:00 the morning after our arrival and were a little anxious about how many tokens we would need per shower however one token was ample to shower both myself and my daughter. While the above might seem a bit negative we would totally recommend this place and we go back! A lovely place to stay. Located in a very beautiful and peaceful setting, The site is well maintained with spacious pitches, the staff are helpful and friendly, the shop is well stocked with provisions and useful items, the Swanage steam railway runs alongside the campsite and is an added bonus. The shower and toilets were clean but the shower on a token system produced so much water that it overflowed into the main corridor. I will stay there again. We stayed here on the first week on June and had a really good stay. A very welcoming site close to the very picturesque Corfe Castle with plenty of space for pitches. We are a couple with dog so didn't want to be too close to big groups but there was plenty of options for us to pick somewhere on the edge so the bigger family groups didn't worry us at all. And even though we are not a family it was nice to see so many enjoying their holidays. The only reason I would not rate it a 5 star is I really don't like having to pay again for the showers (tokens are needed) personally I feel that is exactly what I am paying for in the overnight fee - it was especially frustrating to then find the showers to be quite dirty. That said, we would go back as the positives outweighed this frustration. We stayed here over easter. The weather wasnt great but the location and the facilities are really good with lots of space for pitches and the option of electric hook up for tents. The shower blocks are heated so its a good all weather option and the shop has everything you might need if you forget something! We will definitely be back. Hopefully it wont rain as much next time! I've stayed at Woodyhyde a good 3-4 times now. The prices are good and the toilet and shower blocks are decent enough (though in busy times can get a bit messy with kids). There's usually a good amount of space and the shop is well stocked. The location is perfect with the castle, everything Swanage and Studland has to offer and some favourite walks in the UK on the jurassic coast. The nearby Square and Compass might be one of my absolutely favourite pubs ever and a visit to Woodyhyde isn't complete without a visit. There's a lovely little steam train that runs through the campsite which is very sweet. Also there's a nearby station where you can get on the train to Swanage. Nice touch! The owners are characters but once you get used to them, you appreciate their laidback approach. Though my only issue was, while it's nice they are laidback about dogs (we had two with our party and nice for the kids to play with them), our neighbours locked their dog in a cage in a black tent on a hot day and went off for a nice day out. The poor dog was very distressed and barked for the whole day - it was very upsetting. Having reported it we hoped something would be done but we didn't see any sign of that. Hopefully the owners got our very strongly worded note on their return as we left for home that day. Otherwise, a dependable site that you know what you're getting and in easy reach to so many beautiful places. The location of the site is great. 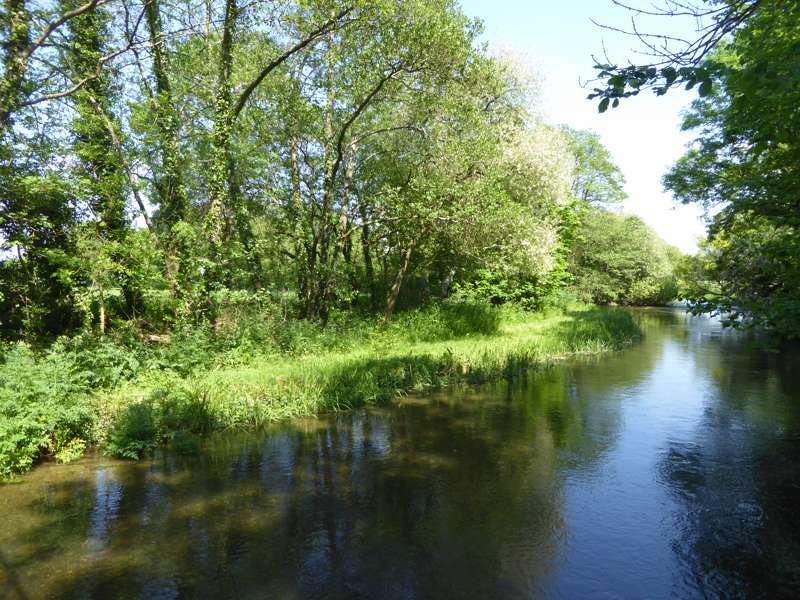 Just off the main road between Corfe Castle (walkable) and Swanage. The site has the Swanage heritage railway running along side one of the fields. We stayed in field one, in a sheltered spot due to the high winds, with hook-up and felt quite hemmed in with a fairly large tent on one side with 'transit' van and a caravan/awning set up on the other side - that was parked side on to the pitch too. Showers were warm the first day, although cold the second day, which when paying for a token isn't really on. There is also no adjustment to the temperature or even an on/off switch for the showers - put your token in and the water runs. The cubical were on the small side too, meaning you couldn't get dry until the shower stopped!! Toilet block was messy on occasions and didn't seem to be well looked after. I had to queue up for a shower on one occasion. Overall it is a bit of a shame as the site and location have so much to offer, but I'm not sure the owners care sufficiently to improve it and make it a great site. The campsite itself is nice, good views, good quantity of showers and toilets (never queued for either during 9 days) plenty of hot water in the showers (too hot sometimes and no way to adjust). the shop is well stocked and field 3 is very roomy, quite sloping in places but plenty of flat areas. plenty of water points in field 3. It got quite busy during our stay and the toilets and showers got dirty quite quickly. they were cleaned once a day but you wouldn't think so judging by the amount of toilet roll on the floor and the amount of mud in the sinks presumably from children cleaning themselves after playing in the boggy muddy forest area. very very few sanitary bins in the ladies toilets and didn't see one in a toilet cubicle - seemed to be one under the sinks in the older block. the site was quite noisy but mostly quietened down around 10.30pm each night. my kids loved it as there was plenty of room for them to play in field 3 (the other 2 fields did seem quite full). However, some campers did seem to think it was fine to camp right next to other tents/camper vans (within 1 meter) and were never asked to move by the owners who we did see on occasions going round and checking. All in all, I won't be returning. Just booked our family trip to Woodyhyde, have to say the new booking system is a great improvement. We always have a great time there and are looking forward to our summer holiday. We last visited during the summer and were thoroughly impressed with the site and the facilities. There have been mixed reviews in the past but we have never had any problems and our kids love going there, the steam train going past is a big attraction! Had a horrid experience here in August. We came home from a day at the beach to find a tent either side of us - 1 metre from ours. Not even room for our car. The pitching rules on the office/shop say 6 metres between tents. This is for safety as well as comfort. The owner was arrogant and unhelpful. Revenues definitely put before customer satisfaction and safety. Shower blocks very dirty. Will definitely not return and definitely not cool camping! This was my first visit to Woodyhyde and I was pleasantly surprised. The shop sells a wide variety of items. There are plenty of hot showers. It's lovely to be on a campsite where you can camp where you like and the picturesque steam trains add to the experience. I'll definitely be returning. We stayed as a couple - and found it to be a very family orientated campsite. There is loads of space and kids seemed to be having a whale of a time on their bikes and around the site generally although this does mean there is a lot of associated child noise and crying when knees are bumped and so on. Dogs also allowed which is great - and there is a dog free field for those who are less keen. Loads of showers so never had to wait, I think some of them might be solar powered as they were a bit chilly on a cloudy morning but the ones in the toilet block were always warm. The shop was well stocked with the basics and also wine! There are a couple of nice pubs in nearby Corfe Castle that serve food and there's a short walk across the fields to get there, but take a torch if you planning to come back after dark! This site was great for a small group of us and there was plenty of space when we arrived on a Friday in June. The loos and showers were fine (50p for a shower) but nothing amazing. The site seemed very windy but the weather was a bit stormy the weekend we stayed so it may have been down to that or just the place we pitched. The shop was open often enough and had the basics. Lots of bird song and mooing in the morning to wake up to, a lovely place. A nice, basic site. A very happy birthday weekend! We arrived the day after the school holidays started and had an excellent weekend camping at Woodyhyde. Booking in was a breeze and we were free to find a pitch that suited us best. Although it was busy, there was plenty of space. Toilets and showers were fine, although the shower could have lasted a bit longer for one token (my friend's shower stopped just as she'd put shampoo in her hair) and they could do with putting shelves in the dressing area of each shower cubicle, as there's nowhere but the floor to put your washbag etc. Just being fussy really. Would thoroughly recommend this place and will be returning! I found this site to be big and busy with less back to basics than you would think - yes you get to camp where you like - but the showers are on tokens etc - so it all feels pretty industirialised compared to others. That said - lovely area - and pitch where you like which is nice - and big - we were there BH Weekend in August - and still there was space - and rain... which might explain it. Loved our stay at this site. Field 3, which is dog free (we have no dog but 2 small children), I can highly recommend. As it August the site was busy but still plenty of room although the other fields seemed a bit crowded. The showers do cost 50p for a good 4 minutes but there are plenty of them so no queuing and they are hot and clean - well worth the mere 50 pence. The onsite shop is well stocked with basics and useful camping items you may have forgotten to pack! Great so see Camping Gas exchange as well. Great view of the steam railway which the kids loved and well away from the main road which could not be heard at all. Plenty to do and see in the area, Studland beach possibly the best beach in the South of England. We'll be going again. Hard to be too picky but a bit too regimented for my liking. Showers are now 50p per token and the customer service at the shop was on the grumpy side. Lots of space (in low season) but fairly noisy from the main road and not safely possible to walk to the nearest pub. Thought additional costs for showers etc seemed a bit silly. Just back from a mums and kids camping trip, 10 of us all together. This campsite was great – lots of space for us to pitch together away from other groups. But then lots of children for our kids to play and make friends with, while we relaxed and caught up with each other. They enjoyed the rope swing over the stream, and the wood copse, and just the freedom to run around the huge fields. The steam train going past was a hit with all of us, and we felt like we had stepped back in time as we followed the path across the fields and stiles to the idyllic little station. It was a good old fashioned holiday and one that we will be repeating. Thank you! Start of March – end of October.